Following in the footsteps of Bayanda Sobetwa come two more South African footballers. Johnviss Tshoboko Moagi, 20, of Johannesburg, and Khayalethu Sikiti, 25, of Cape Town, have signed with South Launceston for the upcoming 2011 Tasmanian State League. Although a bit behind the SANFL, VFL and WAFL, the TSL is still a very high standard and will be a great test for these young men. So too will the chilly Tassie weather. Both players were named in the Lions' elite development squads back in late 2009. Moagi is described as a midfielder with pace and stamina and Sikiti a tall forward with an exceptional vertical leap and long reach. For more read Footballers out of Africa in Tasmania's The Mercury. Bayanda Sobetwa joined Greater Western Sydney in 2010, becoming the first player recruited to Australia from the AFL South Africa program, notionally to an AFL club (although GWS are yet to fully join the AFL). With FootyWILD in many ways the AFL's flagship international program there must also have been a degree of pressure for Sobetwa to perform. It was a huge step up for a young South African with only a few years in the game, and his statistics playing for GWS in the Under 16 TAC Cup were modest. However he did manage 13 games which will have been invaluable experience, making the best players list twice. With an influx of Australia's best young talent into GWS for 2011 and again in 2012, it was always going to be difficult for the young trailblazer to maintain his spot. Happily he has found a home with Port Melbourne and a position at the AFL, and will spend 2011 continuing to develop his game. worldfootynews.com spoke to the AFL's International Development manager, Tony Woods, about Bayanda Sobetwa's efforts to keep his dream alive. Kevin Sheedy and his GWS Giants are continuing their quest to uncover talent of African origin. A recent story revealed Sheedy checking out tall talent at the Sudanese Australian basketball championships at Cambridge Park in western Sydney, and another story focussed on the athleticism and football ability of youngster Zarchariah Sesay, originally from Sierra Leone. Sheedy also reiterated what he has often stated, which is his desire (and now intent) to chase US basketball talent. "Some 4500 basketballers go through the college system in America but only about 60 get drafted". With the backing of his new club it will be intriguing to see the ethnic makeup of the GWS Giants in their first few years in the AFL. It could just become the sport's greatest advertisement for enticing future generations of migrants to the game, not to mention the sport's slowly growing international following. When Cuan Whitefoot moved from Zimbabwe to Perth, Australia, as a 12 year old with his parents, victims of the Mugabe land policies, he thought Aussie Rules was a "girl's game". This may come as a surprise as Australian football often battles a stereotype of being too rough for the liking of some parents. But for kids from a Rugby Union or League background the reverse is true. Nevertheless Whitefoot came to play the game with his new mates and learned to like it, so much so that now, aged 20, he has dedicated himself to winning a spot with West Perth in the West Australian Football League. His story can be read in Aussie rules for ex-pat . Unfortunately a few plans to kickstart footy in Zimbabwe itself appear to have fallen over, with the last attempt, running under the website name Zimfooty, no longer live. We'd love to hear from the organiser, Larry Ferrier, if he still has hope for the game there in the short to medium term. The Sydney Swans have added to their band of foreign legion players, picking up South African-born Eugene Kruger in today’s AFL rookie draft. Kruger, 19, has been training with the Swans and has been outstanding on the pre-season running track, blitzing the field in the 3km time trial two weeks ago. He lives in Sydney and has played Australian football seriously for less than two years, lining up for local side, East Coast Eagles. There's an expectation in Australian football that with the right encouragement there will be quite a few AFL players coming from Australia's growing ethnically African community. Such players are likely to provide role models for further recruits, including directly from Africa itself, such as up and coming South African players. Another increasing trend is for AFL clubs to recognise that there is mature talent in the state leagues and that not being drafted as an 18 year old should not be the end of a player's AFL career prospects. This has been encouraged by recent successes including the stellar form in 2010 of Michael Barlow at Fremantle, and the good form of James Podsiadly at Geelong, both having been plucked from the VFL. Of course the WA and SA clubs have long kept a closer eye on their local leagues, Adelaide in particular using the rookie list with SANFL players to excellent effect for many years and more recently Fremantle loading up on WAFL and VFL players (all these players are open to all clubs but some seem to focus more closely on them). Tendai Mzungu meets both the above criteria. The 24 year old had an excellent WAFL season for the Perth Demons and has been signed by Fremantle via a trade week deal with the new Gold Coast club (whose entry rules allowed them to pre-list some players and on-trade them for a draft pick). The "dashing defender" can be seen below in action on two Youtube clips. It appears he has a mixed background, with some Eastern African heritage. Apparently he has was born in Melbourne to a Zimbabwean father and Perth mother, and although playing Aussie Rules for a long time, didn't even nominate for the AFL Draft until he was 22, according to Meet Freo's draft dodger. AFL South Africa has once again staged its national championships, then followed up with a friendly against the touring Australian Amateur Football Council's Under 23 side, drawn from the amateur leagues in Victoria, SA, WA and leagues in Tasmania. This initiative has seen the Aussies doing the kind of South African tours we've seen in the past, but really getting heavily involved in teaching the up and coming Lions players, especially in an area considered lacking, coaching of team tactics. The third annual footyWILD National Championships culminated with a victory to the home Province Western Cape Magpies over the Gauteng Blues in a tough encounter at Khayelitsha Cricket Ground on Friday afternoon (Oct 1). Besides the match at Khayelitsha Cricket Oval, Cape Town, the AAFC 13 day tour was also scheduled to include an exhibition match at Monash University, Johannesburg, on Wednesday October 6 . It has been an all-round effort, with support from the AFL, the AAFC member states, government and a state league contribution with the WAFL’s Community Development Manager Cameron Agnew outstanding in an umpiring education role throughout. The past decade has seen the remarkable rise of Australian football, or FootyWILD as it is marketed, in South Africa. For all of that time if there was one name, one person, who embodied the game's journey and was the sport's public face, it was Mtutuzeli Hlomela. He has been many things to many people; a friend, an inspiration, an on field leader, and an off field promoter, developer and ambassador. Sadly for many of us who have come to know Mtutu along the journey, the 29 year old from Gauteng has departed AFL South Africa to "pursue alternative employment in Johannesburg". His well documented career began in 1998 when he spent a year in Adelaide with the Sturt Football Club, having arrived thinking he was on a soccer scholarship, but happy to take on a strange new game. We won't recap in detail all the years in between, but over that time Mtutu rose to be South Africa's captain, coach and talent manager. He was twice selected in the World Team after International Cups. 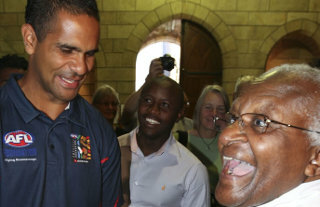 His outgoing and friendly personality saw him become a natural ambassador for the game, he met with Archbishop Desmond Tutu in this role (pictured along with Michael O'Loughlin), and he addressed the AFL Commission in 2008 putting forward the case for support for international footy. His departure will come as a shock to many. On a personal note this author would like to thank Mtutu for his friendship and contribution to the game. And I will always remember playing a "friendly" against South Africa in which Mtutu expertly appeared to fly for a contested mark but in fact was subtly shielding me from the ball to protect his team mate. As we re-gathered ourselves I commented in rough vernacular that he'd beaten me in a nice move, and he smiled and replied that it was experience. It was at that point that it was clear to me that Mtutu was from the new generation of international footballers who didn't just take up the game recently, but really had a sense and a feel for the intricacies of the sport that you only get by actually playing it over a period of time. Best wishes for your future endeavours Mtutu. Carlton Football Club will train in Nike RED jumpers today at at Visy Park to drive awareness and raise funds to fight HIV/AIDS in Africa. As well as training in the RED jumpers, Carlton players will wear RED laces during Friday night’s game against Essendon at the MCG. RED was created by Bono and Bobby Shriver and is a business to raise awareness and money for the Global Fund to invest in African Aids programs by teaming up with the world’s most iconic brands to produce RED branded products. RED partners and events, of which Nike RED laces is an example, have generated $120 million to the Global Fund helping to medicate people with HIV/AIDS in Africa and educate young people in Africa about the disease. The Sydney Swans are excited to announce they have signed one of the most gifted young athletes in NSW to their recently-established Academy. African-born Alex Jalloh, 14, has excelled at soccer, rugby, athletics and Australian football, but has opted to be part of the Swans Advanced Academy, which means he can be drafted directly to the Club in 2013. The Academy’s talent identification and operations manager, Chris Smith, said Jalloh’s signing was a major win for the Academy. “This is a real win for the Sydney Swans Academy where a priority is attracting kids who have the ability to excel at a number of sports,’’ Smith said. “The fact Alex chose the Swans Academy in its first year of operation, over his other sporting options, is extremely pleasing. We’re excited to have the opportunity to nurture and develop Alex’s extraordinary athletic talent,’’ Smith said.